Keep yourself on time in vintage style with this wall clock. Rustic metal framed design with an aged world map decorative clock face. This clock will stand out and make a fantastic statement. Large design with a sturdy metal frame. Perfect for giving an aged, vintage and antiqued look to your interior. Large bold numbers stand out against the background making it easy to read. Minute markers and numbers decorate the outer edge. This is the perfect clock for anyone that loves travelling or has an interest in maps. Keep yourself on time in vintage style with this wall clock. 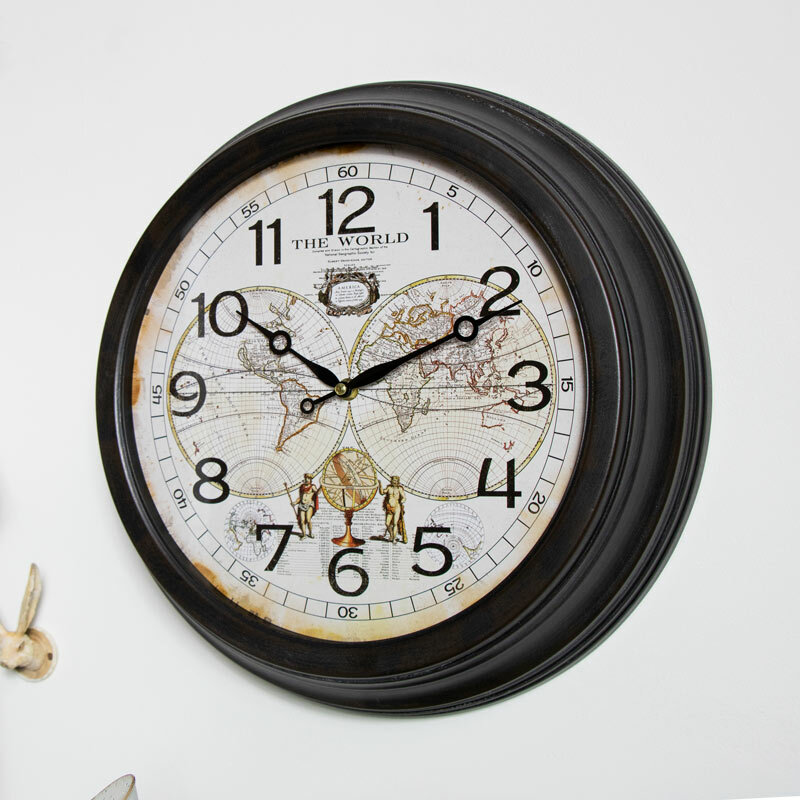 Rustic metal framed design with an aged world map decorative clock face. This clock will stand out and make a fantastic statement. Large design with a sturdy metal frame. Perfect for giving an aged, vintage and antiqued look to your interior. Large bold numbers stand out against the background making it easy to read. Minute markers and numbers decorate the outer edge. 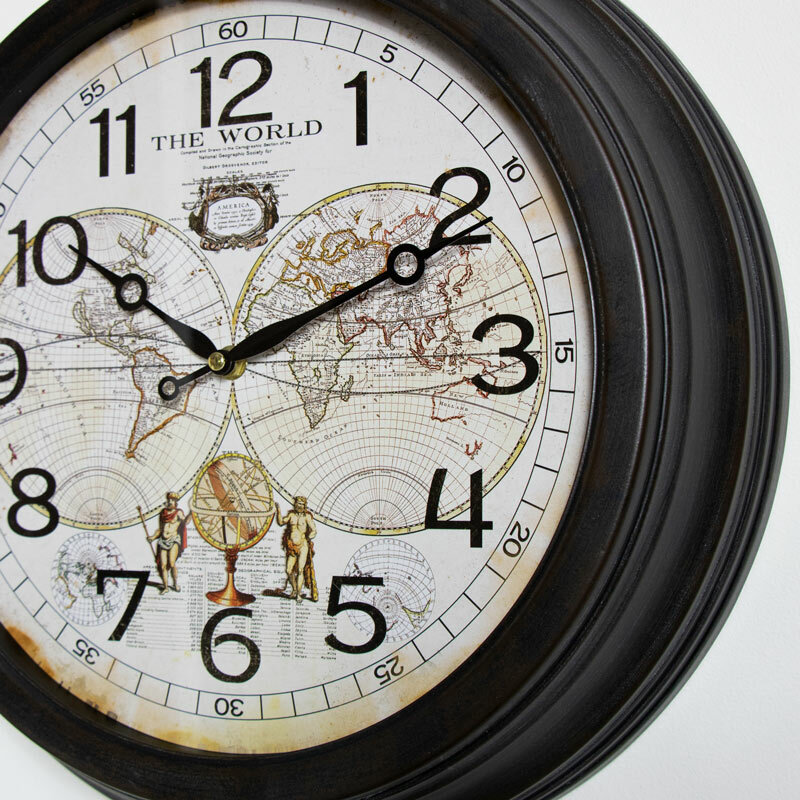 This is the perfect clock for anyone that loves travelling or has an interest in maps. Rustic metal frame in a distressed, rustic brown finish. Aged finish on the clock face. The clock takes x1 AA battery (not included) and is easily wall mounted with a hook on the back.